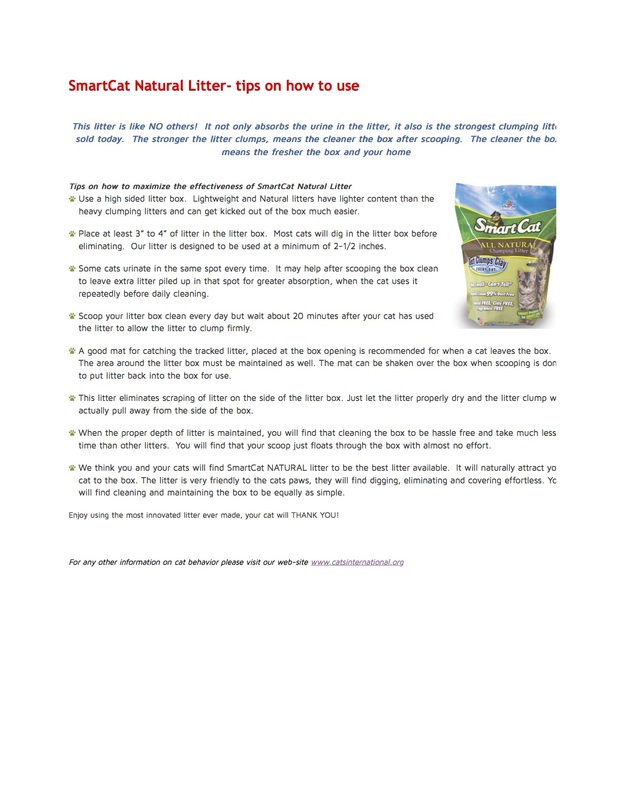 SmartCat Litter is light in weight but strong in performance. 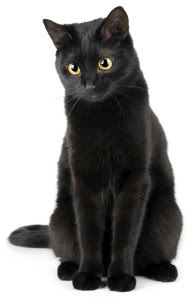 SmartCat Litter begins to clump on contact by immediately absorbing urine. This quick clumping action traps the odor-causing bacteria, and odors disappear. Clumps will continue to harden and dry until all liquid is absorbed. This litter is designed to make everything easy; easy to carry, easy to scoop and easy to cleanup. At transition use 50/50 mix of new litter with existing litter for one week. After that, use new litter exclusively. Place litter box(es) in a quiet area with easy access. Use 1 litter box per cat plus 1 additional box. Locate boxes where cats will not have to travel far, with at least one box on each floor. For best results, litter depth should be kept at 3-4 inches after scooping. The rule of thumb for the number of litter boxes is: one per cat in the household, plus one. Extra litter boxes are necessary because some cats like to defecate in one and urinate in another. Sometimes others will not use a box that has already been used by another cat. Different areas for the litter boxes can prevent location-avoidance problems. 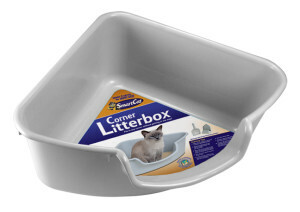 If space is an issue, try a Corner Litter Box™ from SmartCat™. Choose a litter that appeals to the cat. Recommended litter SmartCat® Natural Clumping litter , also read on the “Proper Usage of SmartCat® litter“, most cats prefer the texture of the sand-like clumping litters. Be sure to select a brand with no dust, that clumps into a firm ball, making scooping easier and cleaner. 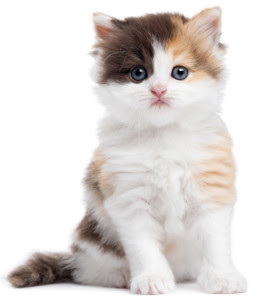 As a health precaution for kittens that might be prone to ingest the litter, use a non-clumping litter until the kitten is under four months old. Do not use litter box liners–they can trap urine in-between the folds of liner and can be irritating to some cats when digging. Also covered, or hooded litter boxes can be offensive to cats as they do not satisfy the cat’s need for escape potential when eliminating. They also trap the odor inside, creating an “outhouse effect”. 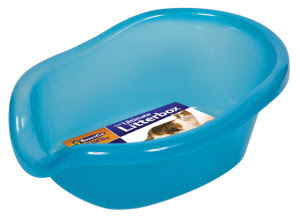 The litter box should be uncovered and at least 24″ x 18″ for an adult cat. Place litter boxes in quiet, private places that are easily accessible to the cat and where they will not be disturbed by children or ambushed by other pets. 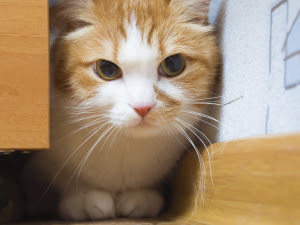 Noisy areas near washing machines, furnaces, or under stairs, may frighten the cat away from the box. A house with several stories should have a litter box on each floor. 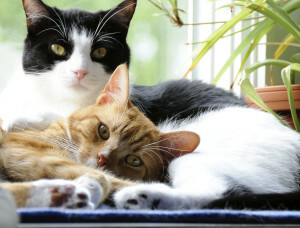 NEVER place litter boxes near food and water dishes. 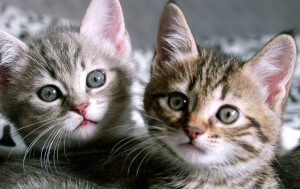 While kittens have an natural instinct to use a litter box easily seen, they may also choose other, more convenient locations if a litter box is not in site. You should limit their territory until they learn that the litter box is the only acceptable place to eliminate and they know where the box is located. Their tiny bladders are not under total control at this age and require frequent elimination. Praise and rewards will speed up the learning process. Like small children, when kittens are playing they get distracted and the urge to eliminate hits them quickly, they should not be expected to travel very far to find their bathroom areas, they won’t make it. Cats enjoy using their Litter boxes if they are in a safe place, clean and have an acceptable litter. Its all a natural instinct. Just give them what they need. 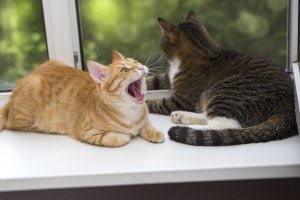 Don’t punish the cat if their not using the litter box – punishment increases the cat’s stress and worsens the problem, find out why they stopped using the box. Since Edward Lowe first placed granulated clay in a bag and called it Kitty litter, the multimillion-dollar cat litter industry has produced an astounding array of litter substrates. While most of the litters on the market were clay-based, there is a growing interest in “alternative” litters. These litters are made of a variety of unlitter-like compounds, such as: paper, corncob, orange peel, wheat, wood, grass, silica, walnuts and peanut shells. 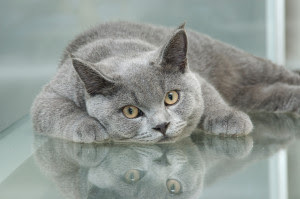 All cat litter manufacturers claim that their products are highly absorbent and great at controlling odor, so how is it possible to choose one among so many? We also know that cats want their indoor bathrooms to meet the same requirements of outdoor toileting areas, even though their little paws may have never touched the good earth. 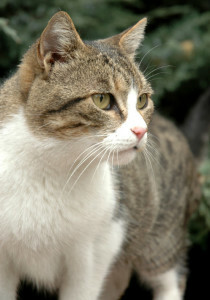 Observations of outdoor cats show that each time they eliminate, they look for a clean area (unlike dogs which like to use the same locations). 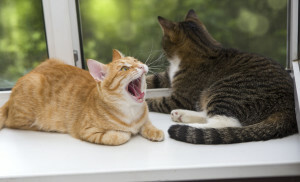 Dirty litter boxes are a main reason for cats to eliminate outside the litter box. Perfumed litters do not add to the cat’s enjoyment of the litter box, nor do they fool the cat into thinking that the box is acceptably clean (although they may fool the owner). Perfume is actually a repellent for cats, this will keep them from using the box. All clumping litters are not created equal–some clump better than others. Usually, the better litters are also somewhat more expensive than the others. The cheap clumping litters that break up easily should be scooped daily and dumped out entirely twice a week. 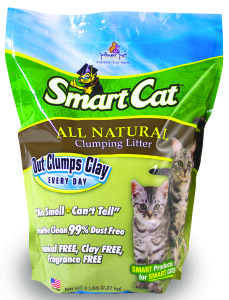 The best clumping litter sold on the market, such as SmartCat® Natural Litter makes the job of litter box cleaning quick and simple. If scooped out daily, the cat can enjoy a clean, dust free fresh-smelling litterbox every day, so can you. Tips on the proper use of Litter. Clay is still being used with people thinking it absorbs most of its weight in moisture, it doesn’t clump at all. Cats do not like stepping on wet litter and wet litter has an offensive smell to cats as well as to humans. Keep this in mind if you are considering an alternative box filler. The strange texture and smell of the new substrate may also put off your cat. If they don’t recognize it as being an appropriate substance in which to eliminate, they will either try to hold their urine (which may precipitate a health problem), or they may find the living room carpet more to their liking. This choice will create another whole set of problems. If you decide to introduce a new litter to your cat, put it in a new litterbox. 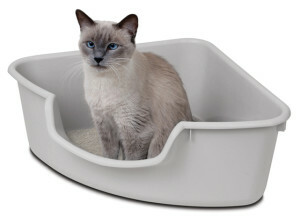 We recommend one of SmartCat litter boxes for a change in shapes The Ultimate Litter Box™ or the Corner Litter Box™. Keep the old boxes the same until you see that the cat is using and liking the new litter. Let the cat discover it for themselves–don’t force them to go into it. You may take some urine or stool from another box and put it in the new box to give them the idea that this is for them. Once you decide on a litter you both like, don’t change it, even if another litter is on sale (that is, unless you really like cleaning the carpeting!) Cats just don’t like change, being especially sensitive to their litter box. There are a few creative products on the market designed to keep animal trespassers out of your yard. One is called the “Scarecrow”–a clever devise that hooks up to your garden hose and works with a motion detector. As the animal approaches the forbidden area, the Scarecrow turns toward the offender and squirts him. (For more information check out www. contech-inc.com.) 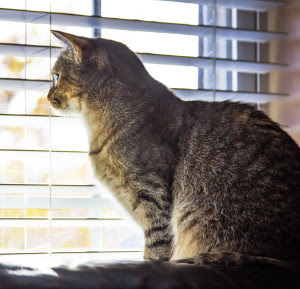 A simpler solution is to keep the drapes or blinds shut at times outside animals are most likely to approach the house. If this happens only at night, then Kitty can be made comfortable in another area of the house away from the room with the view. No house soiling problem can be completely cured without addressing the need to clean and neutralize the soiled areas. If the scent lingers, it will be a constant reminder to the cat that this area was once used as a litter box alternative and that it can be used again. In the case of a vertical urine mark (from spraying) the slowly fading scent will remind Kitty that his chemical message needs to be freshened. 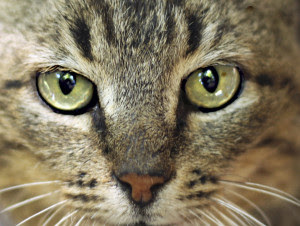 While many products promise to eliminate the odor of cat urine, few actually do. We strongly recommend “Oxiclean” and have come up with a sure tested way to remove the cat urine stain and smell. Please see “Oxiclean” instructions. Deterrents should remain in place for at least a month after Kitty has been using the litter box regularly. When the treated areas are dry, a very affected product sold be Pioneer pet is “Sticky Paws™”. You can also try a vinyl carpet runner to be placed (spike side up!) in the problem area. 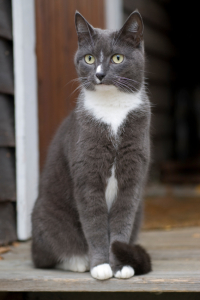 Small motion detectors are also very effective at keeping cats out of selected locations. Radio Shack sells a mini-motion detector that works well with cats. Don’t be tempted to protect the area by covering it with plastic as many cats particularly enjoy urinating on plastic. Thoroughly clean soiled areas with a strong enzymatic cleaner to remove any lingering odor, (recommended “Oxiclean”).